(Nanowerk News) Manipulating the flow of energy through superconductors – materials that conduct electricity with 100 percent efficiency – could radically transform technology, perhaps leading to applications such as ultrafast, highly efficient quantum computers. But that will require a detailed understanding of the energy flow and how it is affected by the interactions of electrons and atomic nuclei in superconducting materials. Now a research team, including scientists from the Department of Energy’s Brookhaven National Laboratory and SLAC National Accelerator Laboratory, has observed those interactions for the first time in copper-oxide superconductors. Using a combination of experimental techniques, including an ultra-high-speed “electron camera” at SLAC, they were able to measure the rapid interplay between atomic motions and changes in electron energy and momentum. “This breakthrough offers direct, fundamental insight into the puzzling characteristics of these remarkable materials,” said Brookhaven Lab scientist Yimei Zhu, who led the research. The scientists already had indirect evidence of how vibrations of the atomic lattice affect the behavior of electrons, he said, but now they were able to observe the interactions directly. The results, published in Science Advances ("Nonequilibrium electron and lattice dynamics of strongly correlated Bi2Sr2CaCu2O8+δ single crystals"), could advance research into powerful, fleeting phenomena found in copper oxides – including high-temperature superconductivity – and help scientists engineer new, better-performing materials. The team looked at a well-known superconducting copper oxide (Bi-2212) that exhibits strong interactions between its electrons and nuclear lattice. The lattice practically always vibrates, and adding even very slight amounts of energy can enhance the vibration amplitudes. The challenge is that the electron-phonon interactions involve extremely rapid atomic motions on the timescale of femtoseconds, or millionths of a billionth of a second. Scientists must pinpoint these motions to understand their effect and potentially manipulate them for future applications. 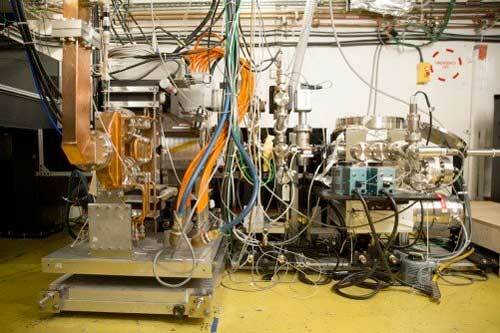 In the new study, the research team used the high-energy electron beam of SLAC’s instrument for ultrafast electron diffraction (UED) to take snapshots of the atomic response following a short light pulse that deposited energy in the superconductor. “The UED method was key to unraveling the ultrafast nuclear motions and in understanding how energy flows through this material,” said SLAC physicist Xijie Wang, who was instrumental in developing the idea of using high-energy electrons for UED. Then, using the time- and angle-resolved photoemission spectroscopy (tr-ARPES) technique at the University of Duisburg-Essen in Germany, the team also tracked the light pulse’s effect on the electrons in the material, revealing changes over time in both energy and momentum. With the combination of these techniques, the scientists were able to connect the nuclear motions to the electronic behavior – an interaction they found to be, in some ways, counterintuitive. For instance, they found that energy from the light pulse flowed from the electrons to different atomic vibrations at different rates, which is quite different from the energy flow when the material is exposed to heat.